When we talk so much about renewable energy, it is natural that all have a question of whether it is clean or not. Let us discuss that here. Side by side we will also see the developments in the use of renewable energy. Renewable literally means ‘not depleted when used’. In this sense Solar, wind, geothermal and ocean energies are renewable sources. As long as the sun shines, the earth and its atmosphere will be heated and this heat energy can be used to produce electricity and heat. They are also clean sources of energy because there is little or no pollution and no global warming emissions when power is generated from them. Thus truly clean and renewable energy is that, it is pollution free, inexhaustible, safe for our environment and health, and moreover efficient. Renewable energy is practical and affordable solution which has created new jobs and industries and decreased our dependence on coal and other fossil fuels. 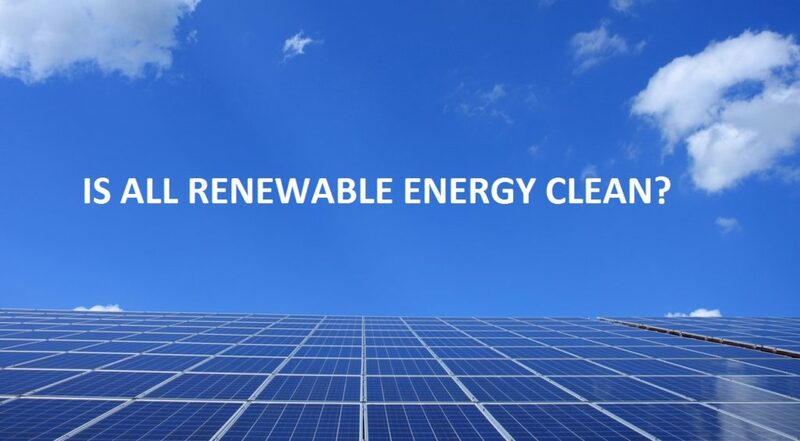 Solar, wind, and ocean based energy can be considered bona fide clean and renewable energy forms as long as they are planned and located in the right places. What about geothermal energy? This energy derived from the heat in the earth is renewable and clean. But studies have shown that much planning must be done to ensure that it is sustainable. There are risks of contaminating the ground water and over time there is the tendency for the land to sink (subsidence), induced seismic activity and landslides. Exploration activity for geothermal energy also cause an environmental impact as it is usually done over pristine and eco-sensitive areas. Hence it needs thoughtful planning. Another kind of renewable energy that can be considered comparably clean is derived from Biomass. Biomass consists of organic matter such as industrial waste, agricultural waste, wood and bark. These can be burned directly in specially designed power plants. It burns cleaner than coal because it has less sulphur thereby releasing less sulphur dioxide while burning. It can also be made to decay using microbes to produce methane which is then used as a fuel. Though it is called a low carbon alternative it still produces a certain amount of carbon dioxide while burning. Indirectly it damages important ecosystems such as forests and grasslands that play an important role in carbon storage. Therefore it cannot be considered as completely clean. Nuclear power is considered a ‘clean energy’ source because it does not release any harmful carbon emissions, but it is not renewable. Its installation operations and management is expensive compared to the others. Another important thing to consider is the safety factor while using and disposing radioactive substances. Radioactive poisoning and radioactive pollution are very real dangers as seen during the Chernobyl disaster 1986 (Industrial accident) and the Fukushima Daichii nuclear disaster2011 (natural disaster due to tsunami). It may be considered as a clean but it must be categorised under “hazardous”. The developments in renewable energy are getting exciting as R&D teams come up with previously unimaginable and innovative ideas. From converting concrete roads and parking lots to solar roadways to power solar vehicles and nearby communities to mining asteroids in outer space, there is no limit to man’s ability to think and adapt. Bio fuel production using Algae: Ethanol produced from corn has been used for mixing with gasoline. But ethanol has side effects of causing corrosion. New research is converting algae into renewable fuel butanol. This alga survives on nitrogen, phosphorus sunlight and carbon dioxide. They are harvested every 5-8 days and dried. Carbohydrates are extracted and converted to natural sugars, which are then fermented to produce butyric, lactic and acetic acids. Butanol is produced by further fermentation of butyric acid and is a lower cost replacement for ethanol. An advantage of using algae is seen when it is grown it in aquatic bodies which are dead zones. Dead zones are contaminated with fertiliser runoff consisting of nitrogen and phosphorus and no living being survives here. The algae thrive here and this can result in the clean-up of the river or lake and thus making the process eco-friendly. Advances in battery capabilities will improve the storage capabilities of the excess electricity produced. These advances come in the form of large utility scale energy storage systems, expanding the micro-grids, faster and more efficient super conductors and new materials beyond current lithium ion batteries. New designs for batteries and new chemistries are being developed. Smart grid technology: as our electric infrastructure ages and is pushed to do more generation and transmission than it was originally designed to do, modernising the grid makes it smarter and resilient. This will reduce the frequency and duration of power outages, reduce storm impacts and restore service faster. There will be improved security, reduced peak loads, better integration of renewables and lower operational costs. The technology evolves in advanced sensors, digital meters advanced relays, automated feeder switches and batteries. Marine technology advances to harness wave and tidal energy from oceans: After wind and solar energy marine energy is the next player in the energy market. Vast amount of energy is produced in the moving waters of oceans and rivers and can be harnessed. The unpredictability of wave intensity and its intermittency are just few of the hurdles to be overcome. The locations suitable to set up tidal energy plants are in hazardous and harsh environments. Also being studied is the effect of devices on the marine ecosystems. A material called perovskite is being tested in solar cells to increase the efficiency of the cell. It is now able to convert 23% of sunlight into electricity. Work is being done to make these cells durable for long term use (at least 20 years which is the average lifetime of a solar panel). One of the most promising ideas for storing renewable energy is to use the excess electricity to split water into oxygen and hydrogen. The hydrogen has many uses in industry and could be used to power hydrogen fuel cell cars. Splitting water was an expensive process using precious metal catalysts like platinum or ruthenium and required large amounts of energy. New developments use inexpensive nickel and iron to create a high quality catalyst required for this reaction. Millions of dollars are being invested into researching methods and materials to improve the efficiency with which we are able to extract energy from renewable sources. We may think the sky is the limit here. . Tobacco farmers are being asked to convert their farms to solar farms instead. There have been people (the very Rich) who are exploring the possibilities of finding resources from outer space. Sea depths, volcanoes, microbes are being studied. Plant and animal behaviour is studied to make improvements in machines and grids. The sky may not be the limit here.